As a snowboarder progresses, learning a snowboarding 360 is one of the first tricks along the way that can be a launch pad to many other tricks. With the exception of the Backside 180, it is the first time a snowboarder will become comfortable with looking away from the direction of travel while in the air. Practice little frontside, backside and switch 180s of small banks to get the feel for it. Practice every direction to build your tricks base and when you feel ready spin it on around to 360. Then do it more. Lots more. Practice, Practice. Before you take it to a park jump, build the good feeling and take that positive vib into your first attempts on something bigger. Trusting in yourself and your abilities is the key. 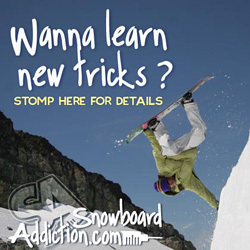 Snowboard-Coach.com visitors get 10% off at Snowboard Addiction. For many rippers on the hill, this video coaching program can spark an explosion of skills. Just use Discount Code "SnowCoach" for any Snowboard Addiction Program.